The holiday season is a time of traditions: hot chocolate and candy canes; humming the same tunes and baking the same treats; feasting and exchanging gifts with family and friends. For some—such as actor Anthony Fusco—A.C.T.’s Christmas Carol is a large part of the holiday ritual. Fusco is an A.C.T. regular, having appeared in over 35 mainstage productions. He’s been involved with A Christmas Carol for the last 17 years, first playing Bob Cratchit in the Dennis Powers and Laird Williamson adaptation. After A.C.T. 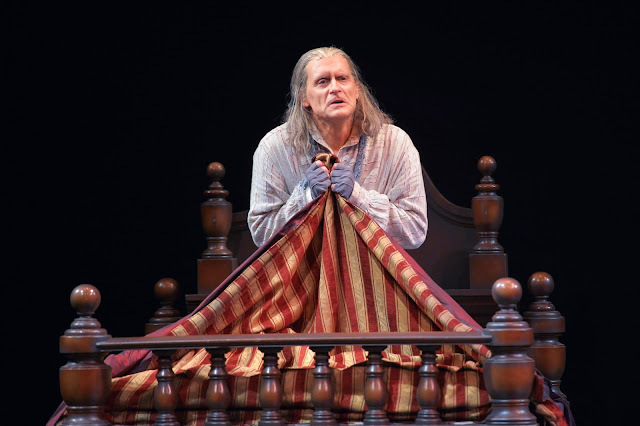 transitioned to Paul Walsh and Artistic Director Emerita Carey Perloff’s adaptation, James Carpenter assumed the role of Scrooge and Fusco was his understudy. “That first year, I went on when Jim got sick, having never rehearsed the role onstage!” says Fusco. “That was exciting!” The role is demanding, as Scrooge never leaves the stage. So Fusco and Carpenter now share the part. We recently sat down with Fusco to hear about what it’s like to return to the same story, but discover new and exciting elements with each revisiting. Anthony Fusco as Scrooge in A Christmas Carol 2017. Photo by Kevin Berne. How does it feel stepping back into the role of Scrooge? It’s kind of like getting back in touch with someone I used to know really well, and discovering that not everything I thought I knew about him is true. Or that he has changed since we last hung out, so the relationship needs to be rediscovered. Or perhaps I’m the one who's changed. On a technical level, it’s always surprising—don't know why it should be, but for me it is—how physically draining the last fifteen minutes or so of the show can be. Oof! How do you keep the play fresh and alive? Every year I go back and read the book. There will always be something I’ve overlooked before, or maybe not have quite realized the importance of: a description of a moment, a little bit of dialogue. Adaptor Carey Perloff and Director Dominique Lozano have been kind enough to consider including some of my latest enthusiasms into the text. Of course, the story’s genius lies in its universality. Sadly, one doesn’t need to do a whole lot to make Scrooge relevant. How does the Carol experience change year to year? Each year’s group of actors naturally brings different energies, ideas, and personalities to their roles—it’s really interesting to rediscover “my” Scrooge in that context. Usually I learn something about the story, and it keeps things fresh. Sometimes I'm a bit put out that my favorite little choice from last year won't work this year, but more often than not the discarded choice creates room for discovering something new and perhaps even better. The trick is to stay open to it. Doing it the same every time would defeat the purpose of doing live theater. Want to incorporate A Christmas Carol into your holiday traditions? The show runs December 6 through 29, and it’s not too early to get your tickets. Join us in experiencing or re-experiencing this time-honored tale!